Kids. They pick on each other for such ridiculous things. One of my most distinct memories from 5th grade is my classmates snickering about how much I clicked my pen, and commenting about how it made me “gay” (a word en vogue at the time as something bad that none of us really understood). Although it’s almost funny in retrospect, it was quite troubling at the time, and led me to go home in tears. I had to buy a new pen to stop my classmates from teasing me with a slur I didn’t even understand. While this was a minor trifle, easily solved, a lot of the other bullying I faced in middle school was more insidious and damaging – not to mention much more difficult to “solve”. I’m a Hindu American, and I grew up in Texas with textbooks that represented my religion in a way that inspired an inaccurate, misogynistic, exclusivist understanding of Hinduism. The kids in class asked what caste I was, why I worshipped cows, and confidently told me that I was going to hell. I could throw away a malfunctioning pen, but the impact that the snickering, insolent questions, and sarcasm from my teachers had on my understanding of who I was and what I believed was something that actually shook my sense of self. That took far more work to repair. I understood my faith to be grounded in pluralism (a step beyond tolerance), and the basis for my moral values (essentially, who I was). To be told that Hinduism was actually the source of discrimination, that it didn’t value me highly as a woman, and that its ancient practices were too weird to accept in our modern American classroom made me feel small and almost deserving of the thinly veiled disdain I received from even my friends. Bullying is a terrible thing in every form, but when attacks come at who a person is… the wounds cut deeply, and infection is a great threat. This experience isn’t mine alone, and not just one faced by Hindus; it’s one that so many Asian Americans face, and why the Act To Change campaign is such an important movement towards empowerment. As an adult, the only balm I’ve found is in remembering that a textbook, a teacher, or a confused friend can’t define who I am, or what my faith is. I define my narrative. The prouder I am of that, the easier it is for my siblings, for my nephews and nieces, for the kids I’ve mentored, to own who they are as well. 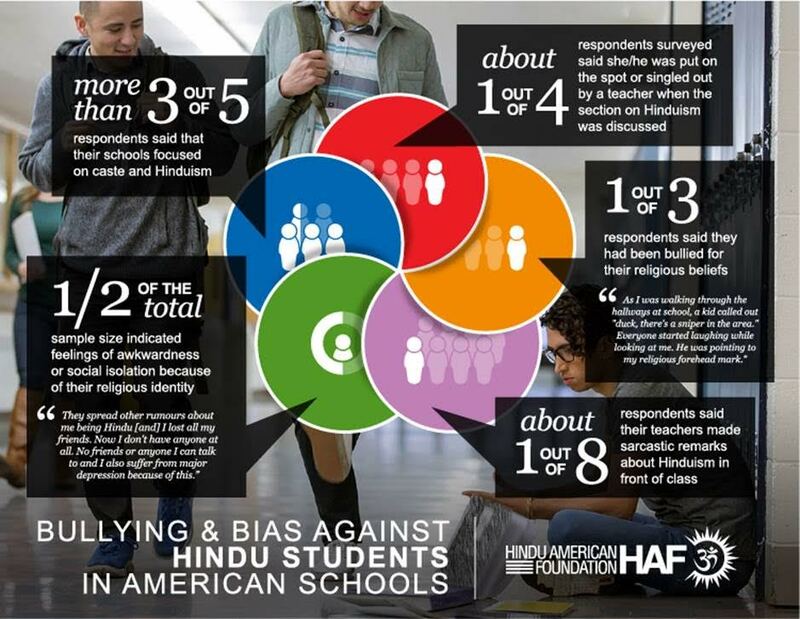 Hindu American students continue to be bullied and feel socially ostracized for their religious beliefs, according to results of Hindu American Foundation’s nationwide survey of middle and high school students. Download the report here. 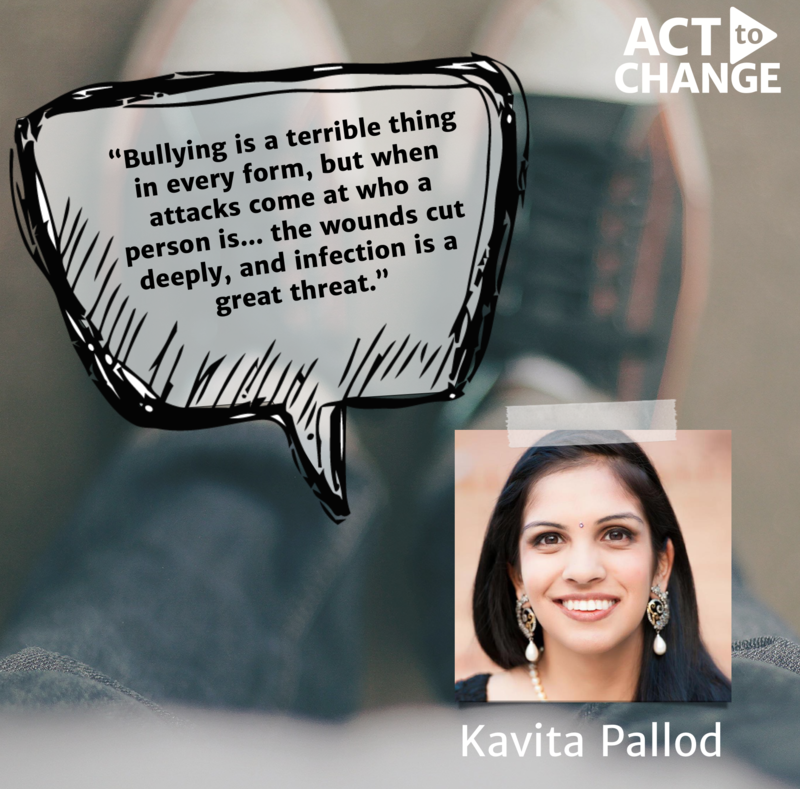 Kavita Pallod is a graduate of the University of Texas and a current doctoral student pursuing her Psy.D in Clinical Psychology at Rutgers University. She is an Executive Council Member of the Hindu American Foundation, a participating member of Act to Change. She hopes to use her passion for her faith and her former teaching background to create fair, accurate, representative resources on Hinduism for teachers to use in their classrooms. She is also invested in mental health, and bridging the gap between the Hindu American community and mental health resources.